Pulling into the Bowman Bay campground after dark with the light of the full moon streaming through the trees, we discovered that Deception Pass had been appropriately named: on the Washington State Parks reservations website, our campsite had been portrayed as secluded, nestled among the bushes and trees-a great distance from any neighbors. In reality, our tent site was exposed and crowded beside similar sites, each occupied by a hulking motorhome, their windows shedding baleful light that overwhelmed the comforting moon glow. So tired were we from our 5 hour drive (which included the rigors of the Puget Sound rush hour), that we barely grumbled about our surroundings, and collapsed quickly into our sleeping bags. 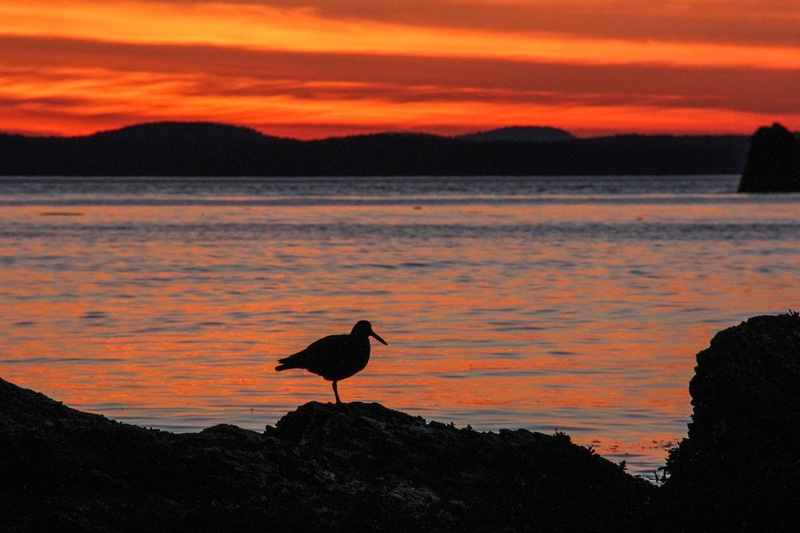 Dawn brought with it a new world, one filled with the song of a thousand birds; the cries of gulls, geese, and oyster catchers mingled with that of forest dwelling wrens, robins and nuthatches. I rose early to catch the sunrise, which glowed a faint orange before being swallowed by fog. The peace lasted until precisely 8 AM, when our neighbors started up their generator, and its hellish humming shattered the still air. We fled to the nearest hiking trail, heading out of camp to Rosario Head, described in multiple guidebooks as one of the best trails in the park. 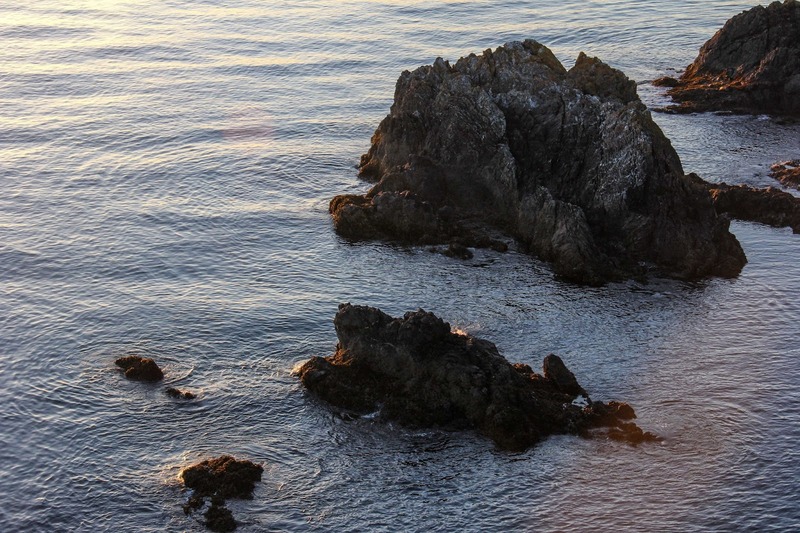 We quickly ascended above cliffs overlooking Bowman bay. The trail winds through open forest, the trees distorted by the elements into fantastic shapes. Though the chill air still had the snap of winter, the carpets of new ferns, with jeweled accents of bright flowers belied the arrival of spring. 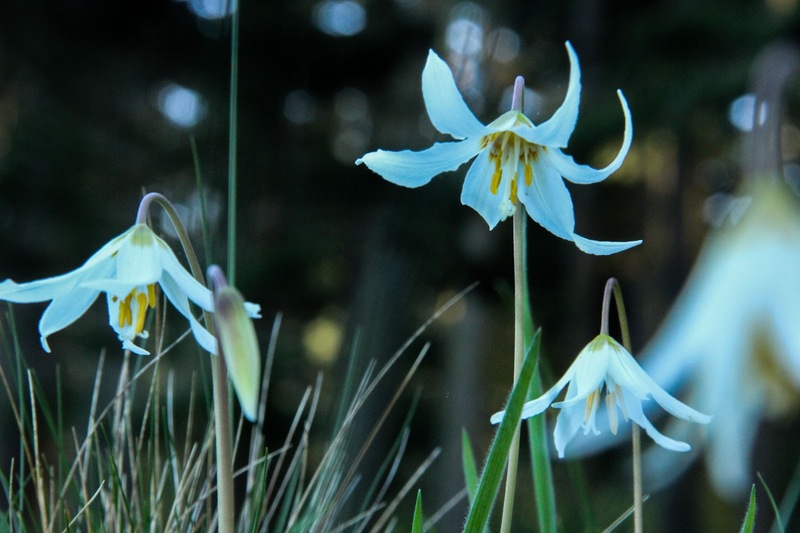 There were orchids, Oregon Grape, and in more open areas Camas, and even Glacier Lilies. Rosario Head itself was spectacular, with views encompassing Puget Sound, the San Juan Islands, and British Columbia. It is also extremely popular, and even at this early hour of the day, the small, meadow topped headland overlooking the tide pools was swarming with visitors, including a folk musician recording a music video! When we returned, with some reticence, to the campground, we were blessed by a miracle: the group occupying the most attractive and secluded campsite had canceled their reservation for the following night. 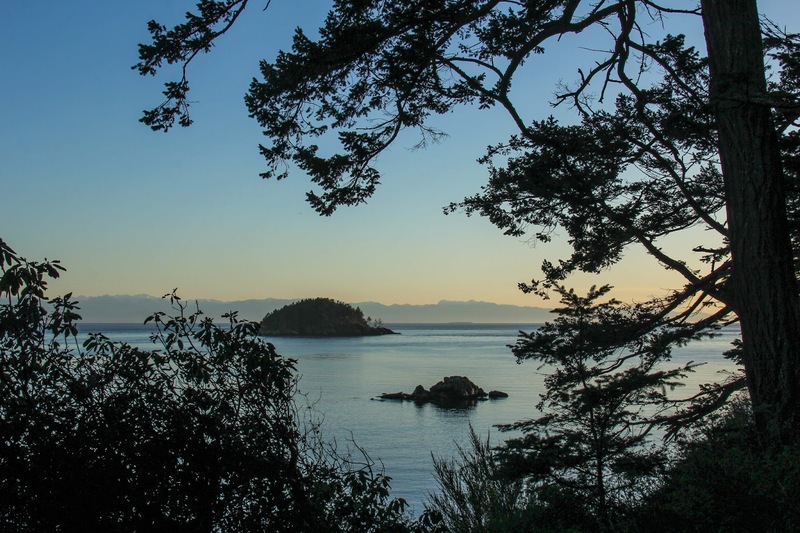 We swooped in to occupy the abandoned site, which had views out across the bay to the Olympics, direct access to the beach, and was set away from the other campers. We were tempted to linger there, in what now seemed like luxury accommodations, but there was too much we wanted to see. 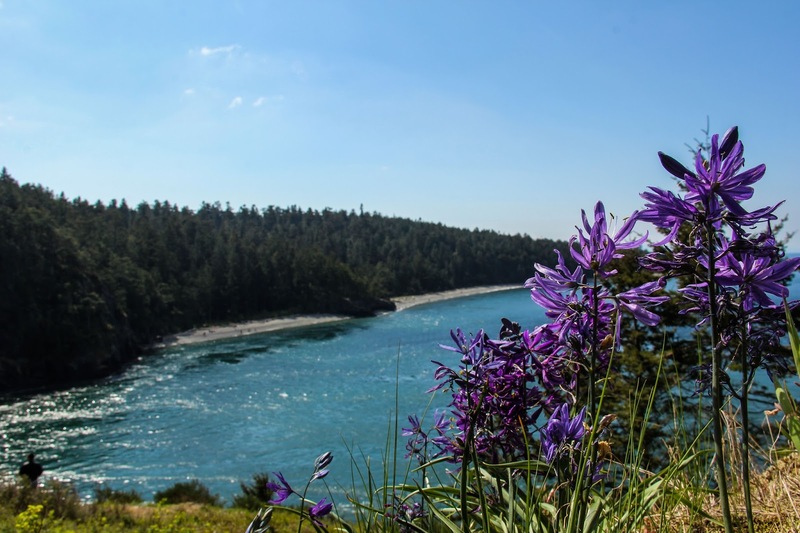 Deception Pass State Park has over 40 miles of hiking trails leading to beaches, headlands, mountain-top meadows, and ancient forests. The question was; what to do first? 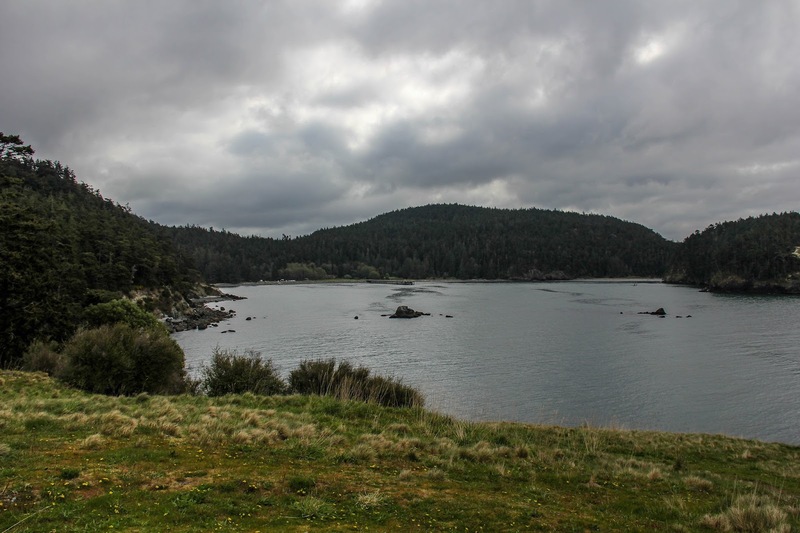 We set out for Deception Pass itself, and nothing could have prepared us for the experience. Pushing our way through the crowds swarming the walkways on both sides of the bridge, we slowly crossed over to Pass Island, trying not to stare downwards at the roaring ocean pouring like a monstrous river through the strait. Not being very good with heights, we stood on jelly legs at the end of the bridge, watching the reactions of the tourists to the astonishing height of the bridge. Some clung in terror to the railings, walking fearfully ahead to the safety of the island. Others leaned with bravado against the railing, taking selfies, and laughing at the acrophobic crowds trembling as they passed. 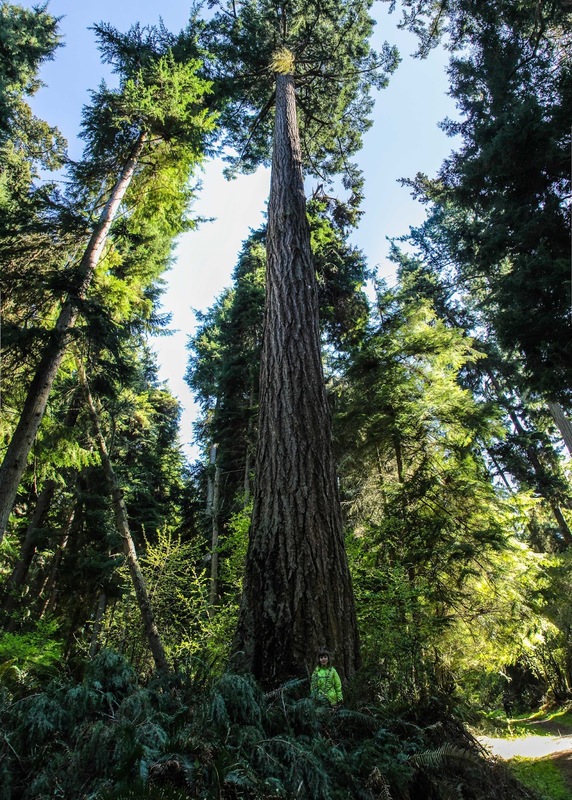 With only a few steps into the woods at the south end of the pass, we left the crowds and the dizzying drops behind as we climbed to the bald, meadow capped top of Goose Rock. We napped in the spring heat on the sun-soaked and glacier scarred slabs of granite that cap the hill. We were hoping to see whales, since from Goose Rock from we had a spectacular view out over the sound. Unfortunately no whales put in an appearance during our time at Deception Pass, and we had to satisfy ourselves with watching bald eagles instead. We could feel the weight of the passing time, and headed off for our next destination. 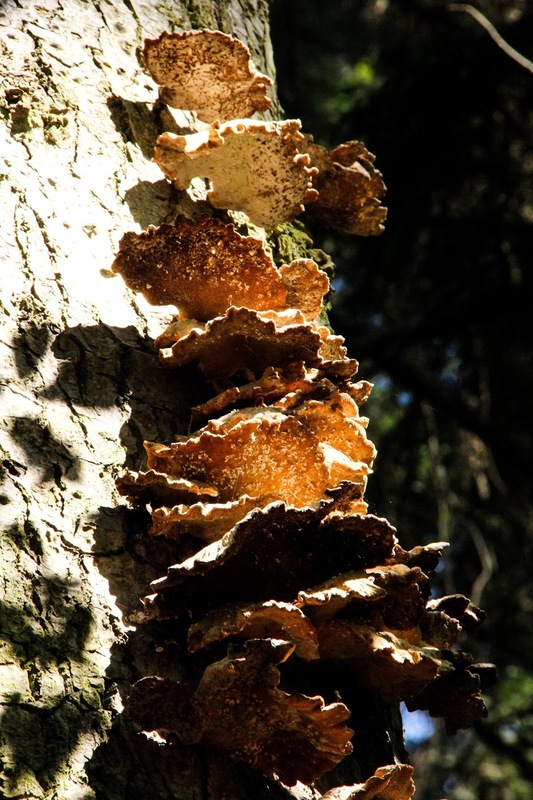 We were lured toward Cornet Bay by the promise of the ancient forest that cloaks Hoypus Hill, which is described so vividly in Footsore #4, part of a series of hiking guides to the lowlands surrounding Puget Sound, by acclaimed outdoor author Harvey Manning. 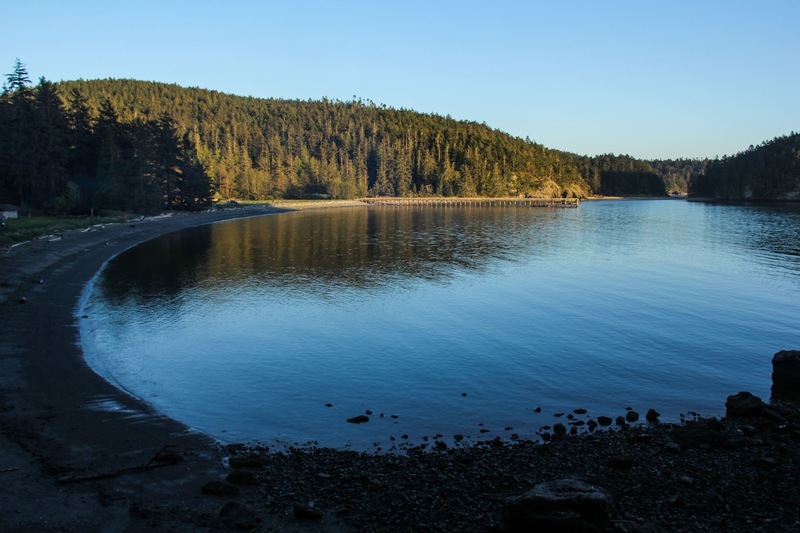 The Cornet bay boat launch doubles as a trailhead for the Hoypus Hill Forest Reserve. The initial hike was not what we expected. A long, paved road leading through second growth forest brought mutters of discontent from the rest of the family, so to avoid a mutiny, we detoured to the rocky beach that parallels the road. 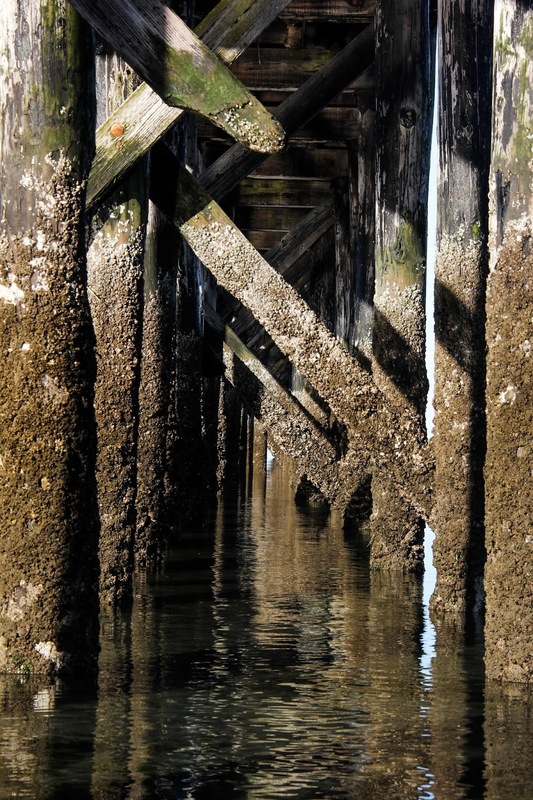 My sister waded the frigid waters, which were amazingly calm now after the torrential tide had ebbed. We peered at shells and mysterious bits of rickrack, until suddenly we noticed that the trees overhanging the beach had grown decidedly larger. Entering the forest once again, we traveled a mossy, abandoned fire road through a forest every bit as magnificent as Manning’s book had promised. With siblings anxious to return to camp, I was able to coax one more side trip out of them. As we drove northward back through the park, it became apparent that the southbound lane resembled I-5 in Seattle at rush hour. Returning to camp was obviously going to be an epic ordeal. However, we persevered, driving towards the imposing mass of Mt. Erie. I do not have the best reputation as a navigator in the family; in fact, whenever I am giving directions, my every word is followed by groans and sarcastic remarks about my mental competency. Therefore my instructions of “it should be only 5 miles”, and “I think we might need to take the last turnoff,” or “I think the mountain is somewhere over there,” did not inspire much confidence. Mutters of mutiny drifted from the back seats. The mutters grew to a grumbling when we turned off onto a one lane forest road that wasted no time in rocketing skyward in a series of blind, hairpin turns. By the time we reached the summit, the grumblings had changed to a frightened, whining screech-similar to that emitted by the Nazgul in The Lord of the Rings. Rubber legged, we stumbled from the car, my siblings so frazzled that they were barely able to stutter sarcastic remarks about me. The views were spectacular though, and extended from the icy peaks of British Columbia, the Olympic Mountains and the North Cascades south across Puget Sound to the hazy lump that was Mt. St. Helens. This panorama almost made up for the dagger-like glares directed at the back of my skull by my disgruntled brothers. Too soon for me we had to leave, and with the smell of evaporating brakes, we made our way cautiously back down the mountain. Our ordeal was not over. Since we had no desire to join the conga line of chaos leading back towards our camp, we elected to take a theoretical shortcut. Despite the skepticism of my brothers, it turned out to indeed be a shortcut that led us back to camp. It is a funny sight to see ones siblings leap from a vehicle and kiss the solid earth at the end of a journey. However, I can say from personal experience that it is not wise to laugh at them while they are in the process of kissing said earth, as you are liable to be thrown bodily into bay. We spent the remainder of the afternoon relaxing on the sandy beach below our camp. Once we had feasted on hot dogs roasted over a blazing fire, I grabbed my camera and made a mad dash to catch the sunset from Rosario head. 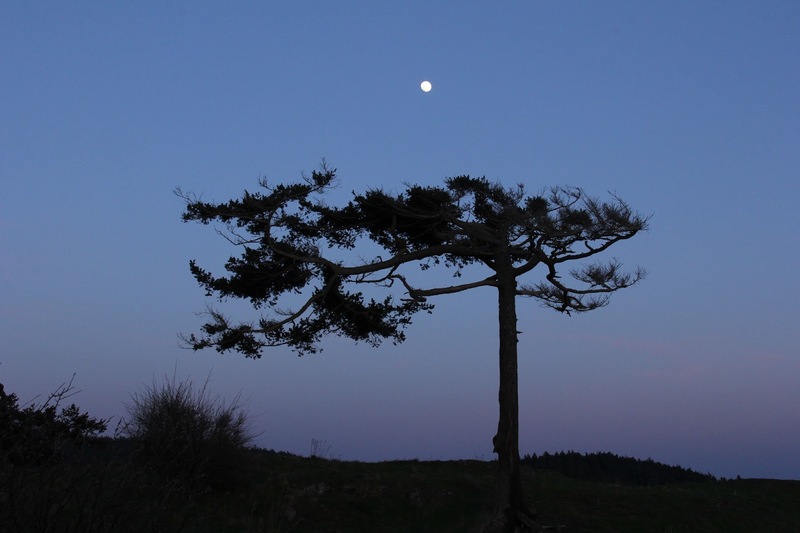 The spectacle of the sun sinking into the rolling mountains of the San Juan Islands was more than worth the long trek through the twilit woods back to camp. Our final morning in camp brought with it a clear sky, with the Olympics hanging like great blue clouds on the horizon. Hiking out to Lighthouse Point, we crossed the Tombolo (a bridge of sand connecting an island to the mainland) and entered a magical, isolated woodland. 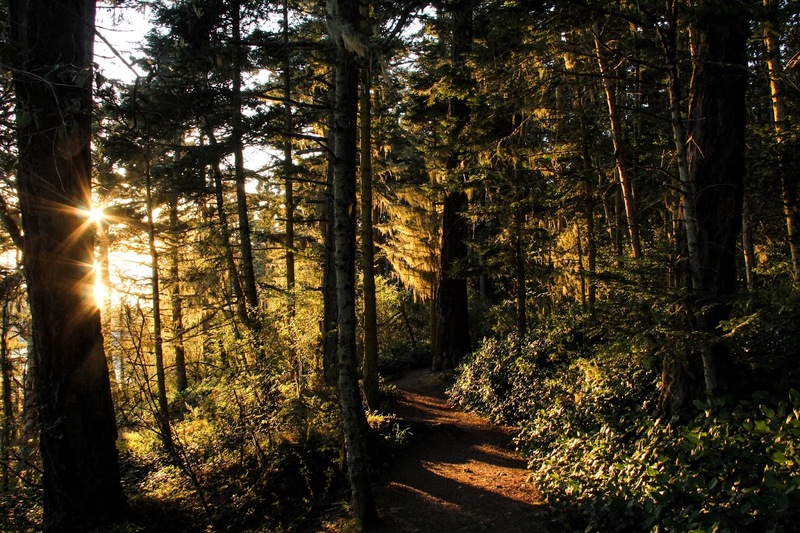 The trail weaves between huge old fire-scarred trees, occasionally rounding meadowed headlands with views ranging from the bridge arcing across deception pass to the wide expanse of Puget Sound, the Strait of Juan de Fuca and the Olympic Mountains. Black sand beaches filled the quiet coves between the rocky headlands, and in the bays bordering these beaches the water was calm and clear; while the sea beyond frothed with the mad rush of the incoming tide. 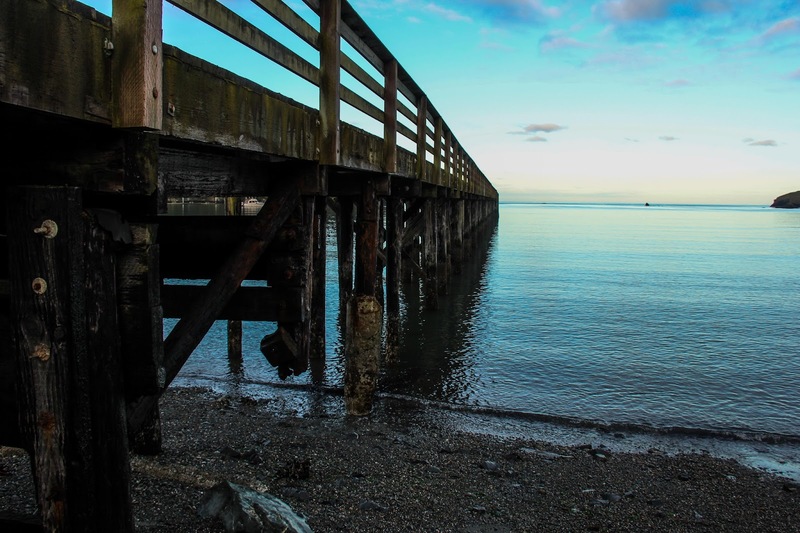 The afternoon found us traveling down the long spine of Fidalgo Island, where the landscape alternates between quiet farmland and bustling, tourist-filled towns. 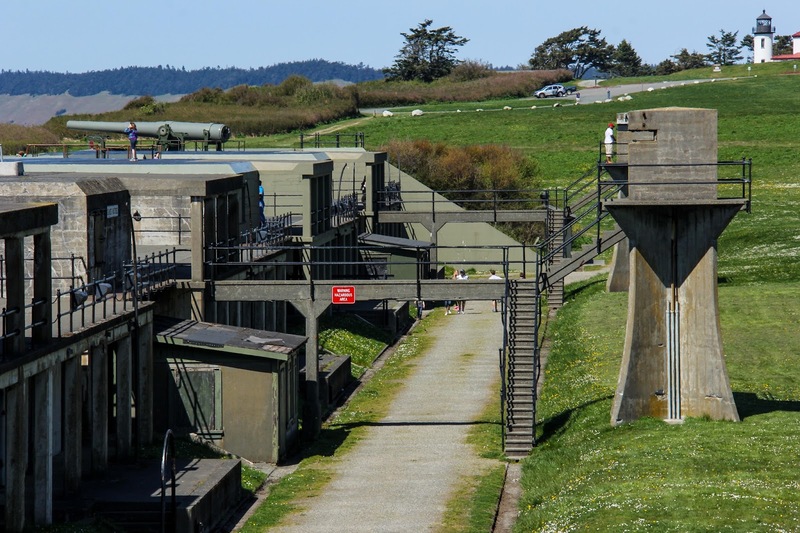 While waiting for the ferry that would carry us to Port Townsend on the Olympic Peninsula, we explored historic Fort Casey - one of the few forts in Washington to still display historic canons atop its concrete walls. 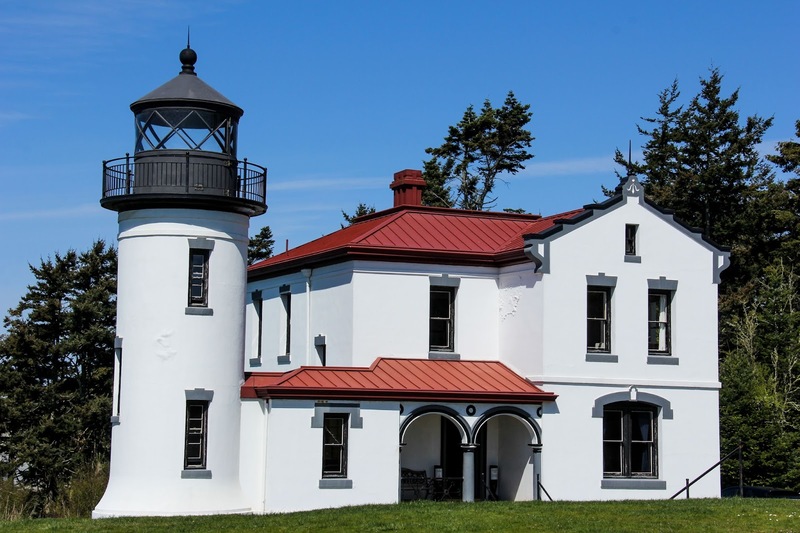 The lighthouse adjacent to the fort is one of the few where they not only allow visitors to climb the tower, but is also free! We almost didn't make the ferry, for we had not known beforehand that the ferry accepted reservations. After an hour long wait at the dock, the ferry arrived. With tensions high, we counted the cars streaming from the cavernous hold, and nervously compared their numbers to the line ahead of us-would we make it? The drivers in cars ahead of us cheered as they were ushered on board, and our hopes of making it onto the boat began to sink. Surely, the ferry could never hold that many cars! Miraculously, we were signaled to go on - one of the last 4 cars to board. 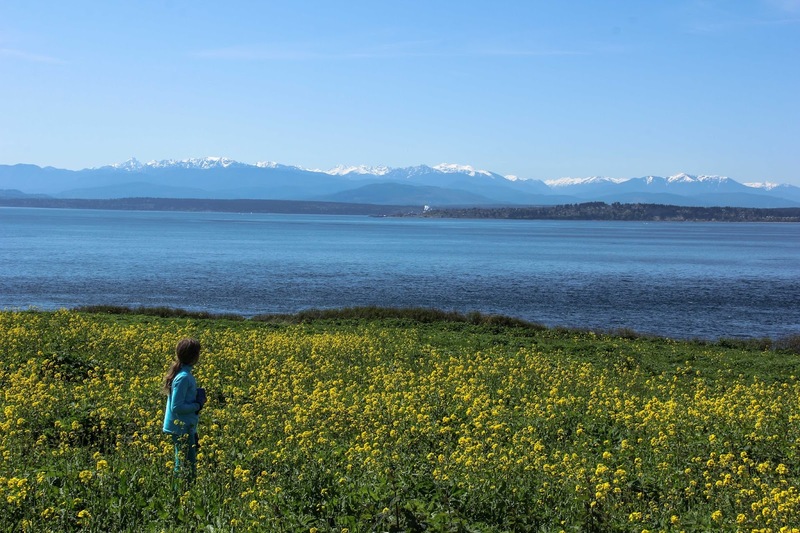 With the Cascade Mountains receding behind us, and the Olympic Range rising to greet us, we sailed towards Port Townsend, and the road home. Love the travel account, the details of the hikes, and such great photos, Andy...can't decide which is my fa vorite. Keep on writing and photo-ing. They just keep getting better and better.